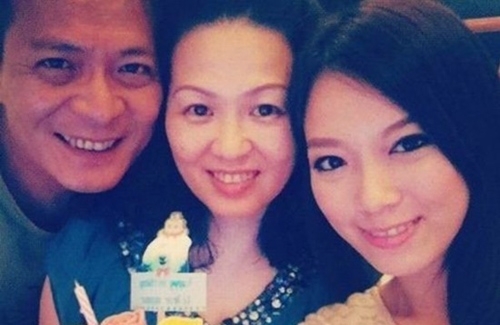 Felix Wong‘s (黃日華) wife, retired actress Leung Kit Wah (梁潔華), was suspected of having leukemia since last November. However, the Wong family wished to keep Kit Wah’s illness under wraps to allow her to recover in privacy, only revealing that she had scurvy instead. Although Kit Wah was hospitalized frequently for long periods, Felix remained positive and brief in his public statements. Seeing that her mother has been recovering well, Adrian Wong (黃芷晴) finally admitted that Kit Wah has indeed been suffering from leukemia for the last half year. Facing the press with a big smile yesterday, Adrian said, “This is the last chemotherapy treatment. Doctors said there’s no need for a bone marrow transplant right now. She doesn’t not need to stay in the hospital for a lengthy period. She will return home after she grows stronger.” Possessing a positive outlook and surrounded by a supportive family, Kit Wah even gained weight during her illness. She should be able to return home this weekend in time to celebrate Father’s Day with Felix. Adrian revealed that Kit Wah continued to work throughout her illness. Kit Wah invited staff from her insurance firm to hold work meetings at the hospital, keeping her mind occupied and off her health worries. Kit Wah even joked that she has been “very busy and did not go on a big break” while being treated for leukemia. really? that’s your comment? i guess what you’ve is called sensitivity challenged. what a sad world we live in. If the they are willing to tell the truth and details of her illness, Why lie before, vehemently denying that she even had fevers or was hospitalized? I made that comment cos i can’t stand liars. Neither can i stand people like you who pretend to be so self righteous! it’s a personal matter, so why do they have to tell you anything? what an entitled selfish loser. i’m not pretending to be anything, but obviously have no clue what they’re dealing with. so i’m guessing when you’ve cancer you will make a front page announcement? yes! i’ve cancer, i’m about to die and my 80 years old mother doesn’t know this but let’s put it on the front page. idiot! you’re a playing judge and i’m righteous? what a loser! To lolnot, spare me yr hypocritical BS and moral what-not. This is not a religious website where everyone has to cluck like you and say only nice things. No one is saying that the Wongs hv to make a public announcement. Just saying that there’s no need for them to spin a ridiculous lie or even to make this announcement now. Absolutely unnecessary IMO. @lolnot, read yr own comments and tell me who’s the one who’s judgemental. And yes stop trying to pretend to be so self righteous. Leung Kit Wah may have had scurvy in the past, so perhaps that’s why the Wongs used this as a shield from further paparazzi intrusion. It’s Kit Wah’s own health issue and she is no longer a celebrity. She is only accountable to her company as to why she is missing work. I think it was a wise decision for her to downplay her illness so that she can rest without constant reporters tracking her every move. Felix didn’t say much to the press; Adrian has been the spokesperson for her mom. Adrian acted very composed and collected before press. I think the Wongs handled this situation well…they were dealing with a very stressful family health situation and they just want more privacy to deal with it. After Kit Wah is recovering well, they revealed the truth. Perhaps they were not completely honest, but their lies didn’t hurt anyone and they were only trying to protect Kit Wah in a fragile state of health at the time. Well said and I must say that I also do not like it when celebs lie but it really depends on the situation and why they lied. Also,yes Kit Wah is no longer a celeb but was once one and is married to one and has a daughter that wants to be an actress too. In this case,it is understandable why they lied but it does not matter as it is more important for her to recover and get well. I had a feeling she had a very serious illness since even in the above photo,she looks very pale and seriously ill. I also think it’s fine if the Wong family initially decided to keep the news away from the public. It’s none of anyone else’s business anyways. Who wants to face the media when they’re suffering from this kind of disease? Everyone would want some privacy. Yeah, I kinda suspect it was something more serious than scurvy. Happy for her that she’s completing her last chemo treatment. My dad went through chemo when he had cancer and it was harsh. She’s still very young and she has a good chance of fighting it. Wish her well. Hope his wife will get recover as soon as possible. Still can’t stand Felix’s daughter, there’s something annoying about her. I agree, it’s just something in her look make dislike her. Why did they use scurvy as the decoy? Strange. I wonder why they are allowing Adrian to do all the talking? Is it to bring her more to the spotlight it make her get used to talking to reporters so that she can handle these situations later when she is truly in the e circle? I saw her interview when she did the promo for the world cup event last week. Frankly I was shocked not only cos her voice was very gruff but also at her very unrefined manner of speaking. Don’t forsee her going very far, if at all, in this line, CMI. Hopes she has a speedy recovery! If she’s still able to go to work and have meetings, her situation shouldn’t be that bad. Wishing a speedy recovery for the lady. All they have to say is “it’s a private matter” or “no comment” or “we will disclose when the time is right” woudl be suffice, why bother hiding the truth with a lie, and having to disclose it later? Eggs on their faces. Why chose scurvy? They must think the public are fools.!!! I was thinking in this day & age scurvy? Why not say it is a private matter. …to be discussed later…? Again that’s my two cents worth. In future suppose they announce anything is it believable? No idea…Shadow of doubt has been cast…? The nerve of people here who think that they have the right to know another family’s personal matters. “Eggs on their faces”? No, eggs on your face for demanding that they have to answer a certain way to satisfy your curiosities. This is a lady with LEUKEMIA, for fck’s sake. She and her family can answer HOWEVER THEY WANT in order to help them proceed along during this trying time. You people need to reassess your priorities. No one “demanded that they answer in a certain way”. Their daughter as spokesperson vehemently said “scurvy”. If she hadn’t said such a strange thing for a modern 21st century city resident to have, there probably wouldn’t have been as much press interest. I agree with other comments, that she should have just said that it’s a personal, private matter, and not lie. Perhaps scurvy-like symptom (mouth sores, etc.) is a result of the chemotherapy treatment. Have people thought about that? People have the right to decide when to divulge their private information to the public, if they chose to. So what if they are not very forthcoming with their private lives? Maybe some people are lucky not to have family members who had to suffer this kind of illness. For those who have had family member(s) who had to suffer the treatment of cancer knows effect of the emotions and the roller-coaster rides that the patients and their family have to go through. So unless we truly understand the reasons behind people’s statement. Perhaps, we should just take their messages at face value and wish them well. The world would be a little brighter and kinder if each one of us would stop making unfounded accusation of people’s intention and be a little more understanding. I agree with you Winnie. No one is actually interested in leung kit wah’s illness anymore so why the sudden decision to disclose her actual condition? Looks like the family is trying to get into the news in every possible way even to the extent of sacrificing their privacy voluntarily. This is pretty much how I feel. I really feel bad for some of these actors who will never have private life and there will always be some reporter sneaking around trying to catch them in a bad situation. – Look at Cheung Tat Ming, he had cancer and they got pics of him looking frail and sickly. I’m sure he really did not want to be stalked and photographed when he was seriously ill. After seeing the pics, I felt so bad/ambarassed for him. I know I would hate that and I’m not famous. IMO, it’s just predatory. Other people’s suffering makes them money. Other people’s lives are just not our business (they deserve privacy) and we aren’t owed the “truth” unless they decide to make it public. I don’t hate the Wongs for not disclosing the truth, but it makes it bad to send well wishes when you don’t know how serious it actually is. In a bad/funny kind of way, I couldn’t stop thinking of pirates every time I read an article about her scurvy lol. Now that I know it was Leukemia, I feel kind of bad for making a mental joke about her illness. Glad to know that she is recovering though and wish her and her family well for a long time and hope that it doesn’t come back! I do hope her cancer is in remission, and I wish her well. cover up statement. Not my style. I have gone through the same thing. In the same boat. Most probably I should know what I am talking about!!! Very sorry to hear about your husband. I lost my best friend to cancer and it hurts me to this day. Hope your husband will always be healthy. Leukemia is a very serious so I hope she gets well. Get well soon! !..Hope it won’t relapse and fully recover. Lie or not doesn’t really matter in this case. Most important Get well soon. Scurvy? Ha. I knew it. Off topic: Felix is lucky to have a gorgeous looking daughter!